Here’s an excellent deal on copy paper. 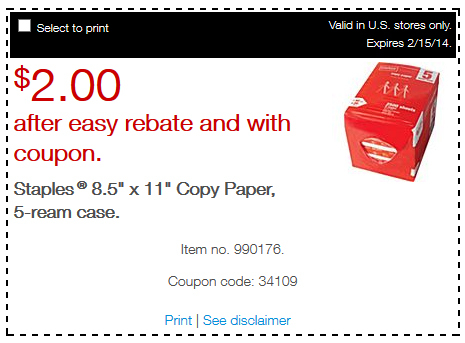 Grab this coupon for a 5-ream case of Staples 8.5″ x 11″ Copy Paper and pay only $2.00 ($0.40 per ream) after easy rebate and coupon (scroll down on page to find coupon). I hate running out of paper when I’m printing coupons. Pay approximately $24.99 plus tax and then submit rebate form for cash back on your purchase. Coupon expires February 15, 2014.